Market observers have noted that the S&P 500’s performance so far this year has been dominated by a small number of technology stocks. This observation is certainly correct, although it’s fair to question the relevance of a statistic based on fewer than two months’ data. What’s more important is to bear in mind that this is not unusual. For most equity indices, skewed returns are the rule, not the exception. The chart covers a 20 year period, but we don’t need long time horizons to detect skewed results. For the S&P 500, e.g., returns have been positively skewed in 23 of the past 27 years. Results are similar for other markets. Why should investors care about skewness? Return skew helps explain the persistent underperformance of active managers. Our SPIVA scorecards, as well as a wealth of historical data, make it clear that most active managers underperform most of the time. This is a natural consequence of skewness. Active managers hold only a minority of the names in an index. 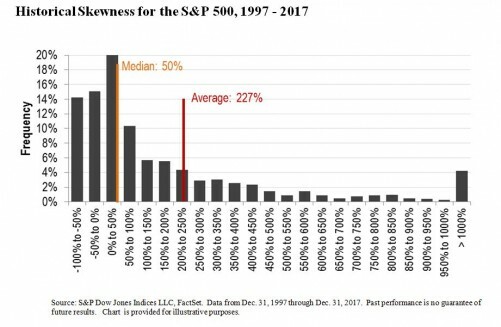 Every stock they select has a 50/50 chance of being above median, but, when returns are skewed, less than a 50/50 chance of being above average. Active stock selection starts with a disadvantage. Active managers sometimes argue that their performance problems arise because they’re not active enough, and that results would improve if they invested in only their “best ideas.” Return skew means that concentrated portfolios, generally speaking, are counterproductive. If performance is driven by a small number of stocks, the more concentrated a portfolio is, the less likely it is to own the big winners. It’s quite common for equal-weight indices to outperform their cap-weighted counterparts. Since 380 of the 500 stocks in the S&P 500 have a higher weight in the S&P 500 Equal Weight Index than in the S&P 500 itself, if only a few stocks will determine portfolio success, an equal-weight portfolio is more likely to overweight them. Thus, other things equal, positively skewed returns favor equal-weight indices. If skewed returns continue for the balance of 2018, it would be unsurprising to see active underperformance and equal-weight outperformance continue as well.